Jute is known to be the most affordable natural fibre, widely used across the world for variety of purposes. It is accepted by large number of buyers and customers for its bio-degradable nature as well as durability. In the present era, Jute Promotional Bags play a vital role in the corporate sector. These bags can be used for promotion of brands, companies, etc. and in award programs, trade shows and conventions, company functions and sponsored events. 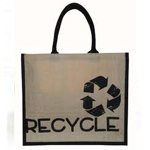 Such eco friendly promotional bags are available in the market in variety of colors, sizes, and styles. Moreover, to suit the latest market demands, these bags also come with remarkable features such as zippers, pockets, straps, handles, and more. Many companies also use Quality Jute Promotional Bags during the time of Diwali, New Year and other occasions for gifting purpose. Big corporate houses make use of these bags for the promotion of campaigns, thereby enhancing their brand and company logo in promotional campaigns. Customization or personalization of jute promotional bags is eminent in the corporate sector. Hence, one can find a number of Jute Bags manufacturers, providing services for it. Herein, the prints, color sequence, embellishments, style and size are all decided by the customer, on basis of which the new bags are developed. Even the bag sleeve length and carry type (shoulder type or hand type) are also decided by client. The best thing about the jute promotional bags for publicity intent is that these are lifelong and have very low production cost. Feel free to send query regarding any kinds of promotional jute bags, printed promotional jute bags, customized promotional jute bags, eco friendly promotional jute bags.